If you watched my recent haul video you will have noticed that I have an interest in fragrance free/unscented natural and organic skincare. The main reason for this is because there are times when I need to cut back on essential oils. 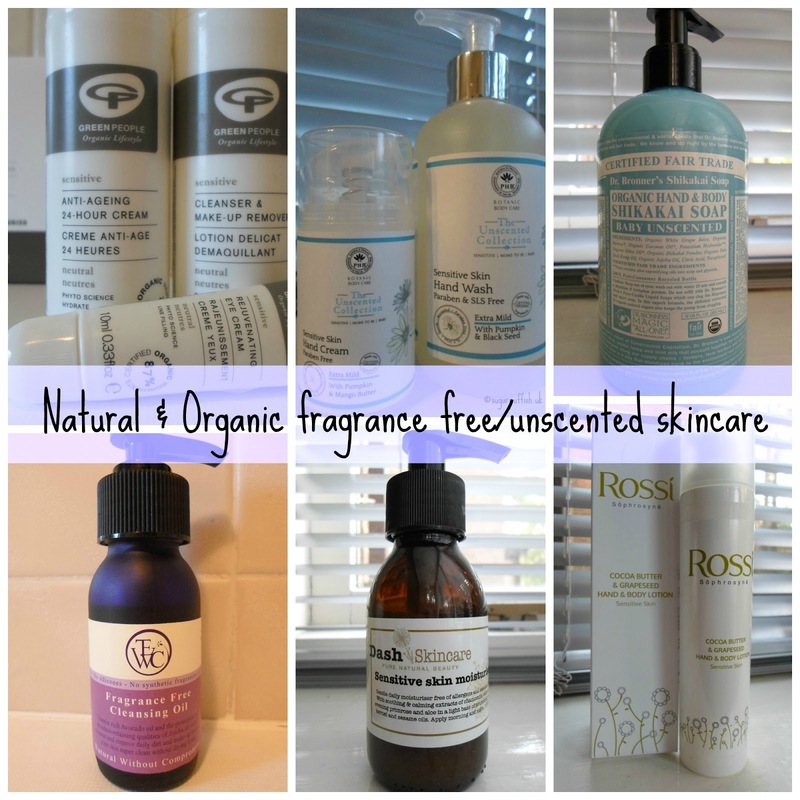 After receiving an email from a reader on this very topic, I decided to put together a list of brands that I know offer fragrance free lines or products where there is the option to purchase unscented versions. Let me start with some basics options. Never underestimate the power of a Konjac Sponge they are great with or without product. DIY can be a simple solution for those having problems with fragrance, a plain carrier oil (e.g. jojoba, apricot, peach, avocado, argan, coconut etc) can be used for moisturiser and cleanser. Gaia Creams and Natural Wisdom are brands that use raw ingredients in their products with unscented options. TEWC, Pure Chimp, Handmade Naturals, Dash, Opulentia Organics, Ruth Romano, Balm Balm have individual products in their ranges that are unscented. On the other hand, PHB, Rossi Skincare, Green People, Akin, Lavera, Desert Essence, Acure and Dr Bronner’s all have a fragrance/scent free range of products. Please remember that the terms “fragrance free” and “unscented” are open to interpretation and interchangeable in their definition. There are no regulations to govern how these terms are used. "Fragrance free" implies the product has no odour whereas "unscented" implies the manufacturer has not added fragrance to the product. However, some manufacturers can label a product "fragrance free" but it contains additives intended to mask the odour of other ingredients. Under the EU Cosmetic directive there are 26 fragrance allergens which should be identified on products if their concentration exceeds 0.001% in leave-on products and 0.01% in rinse-off products. I think the key to managing sensitive skin is reading labels and educating yourself about ingredients. I am sure there are brands I have missed from my list so if you have a suggestion please leave a comment below. This is incredible, thank you for the effort you put in this. So many will appreciate this post. I didn't know you make videos need to get on that! Its great to read a post that understands that there IS a difference between unscented and fragrance free AND mentions how hazy and blurred the lines can be around this difference depending on labelling/interpretation/brand etc. Also excellent list Sarah, there were a few I wasn't familiar with myself, just goes to show how much research we have to do in this crazy beauty industry! I constantly see Dr Bronner's products all over the place in organic supermarkets in California, was wondering if it's good.. Sometimes I do prefer unscented products, especially in simple soaps. Just because I am "clean hands" freak and wash my hands at least thousand times a day, and if that all would be accompanied with a fragrance, it would be just too much:)!